WESTFORD, MA. January 5, 2017 –– Tyco Security Products announced that Pennsylvania State University has invested in security technology from Tyco Security Products to protect and manage access and video in its residence halls and other areas of its campuses. The deployment of the new video and access control solution at eight of its Commonwealth Campuses represents a system-wide upgrade to its residence hall security, including the Software House C•CURE 9000 security and event management system and iSTAR door controllers, STANLEY Wi-Q™ wireless locks, Illustra mini-dome cameras and the victor video management system and VideoEdge NVRs from American Dynamics. 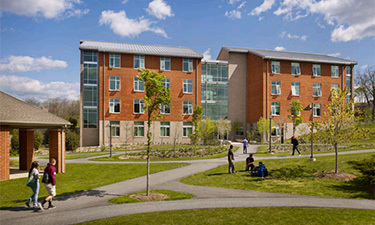 The adoption of C•CURE 9000 brings the residence halls at Penn State, as well as several other key buildings, onto a unified access control platform that now communicates with newly installed STANLEY Wi-Q wireless locks. The installation of the locks provides greater operational ease of use for both students and staff, and reduced time and money spent on retooling locks and replacing lost cards. Another major part of the Penn State system-wide project was the installation of several hundred Illustra cameras as perimeter security for the residence halls and several other buildings. The cameras are monitored via the victor video management system and VideoEdge NVRs. Siemens, with offices in Pittsburgh, Philadelphia and Harrisburg, served as the Commonwealth Campuses’ integrator on this project. To read more on how Penn State standardized on a unified access control and video management platform, click here to read the full case study. The Pennsylvania State University encompasses 24 campuses; 26,742 full-time faculty and staff serving nearly 100,000 students; a teaching hospital that provides care to more than 1 million patients annually; two law school locations; over $800 million in research expenditures; more than 500,000 active alumni; an online World Campus that empowers anyone to pursue an education—anytime, anywhere; and the largest student-run philanthropic organization in the world — THON.